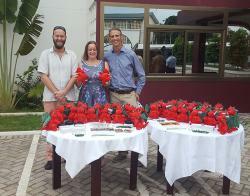 On the 1st July 2017, with support from the International Education Centre, staff SENRGy’s Lars Markesteijn, Genevieve Lamond and James Walmsley with Deiniol dragons and other Bangor University alumni gifts during the event in Accra, Ghana. July 2017. from the School of Environment, Natural Resources and Geography (SENRGy) hosted an event at the Consir Executive Lodge in Accra for Ghanaian alumni, current distance learning students, and prospective students to share experiences, network and to hear about what Bangor University has to offer. The event also marked the start of a two-week study tour for students on the MSc Tropical Forestry programme. Dr James Walmsley, Director of the Forestry and Tropical Forestry Distance Learning programmes at Bangor University, welcomed everyone to the event, along with three colleagues from SENRGy (Genevieve Lamond, James Brockington, and Dr Lars Markesteijn). In attendance were a number of Bangor University alumni including Cecilia Kwateng Yeboah, (MSc Sustainable Tropical Forestry, 2015), Emil Amoah (MSc Environmental Forestry 2016), Samuel Ayitey (MSc Chartered Banking 2016) and Professor Phillip Nyeko (PhD Forestry, 2001). There were also guests from the University of Ghana who are currently collaborating with Professor Julia Jones on a new exchange programme involving undergraduate students from Bangor University. It was an honor to welcome Dr. Victor Agyeman the Director-General of the Council for Scientific and Industrial Research (CSIR) who gave an inspirational talk about how he overcame adversity to become the eminent researcher and lawyer he is today. The event was a great success, enabling current students to meet with and learn from a number of alumni. James Walmsley, Emil Amoah (MSc Environmental Forestry 2016), Cecilia Kwateng Yeboah (MSc Sustainable Tropical Forestry 2015), Genevieve Lamond, and James Brockington at the event held on 1st July in Accra, Ghana.Guests were also presented with a highly prized ‘Deiniol dragon’ and a live band entertained everyone, even persuading some of those gathered to demonstrate a range of impressive dancefloor moves! Reflecting on the success of the event, James Walmsley commented, “We really value our global network of alumni. It never fails to amaze me what our graduates go on to achieve in their careers, and the depth of their generosity in sharing freely of their experiences and wisdom with our current students. As well as this great alumni event, our two week study tour in Ghana benefited greatly from the contributions of numerous other Bangor alumni”.